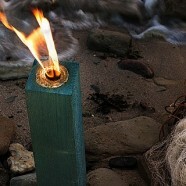 Wooden outdoor candles are perfect for windy weather, summertime on the beach or in snowy winter conditions. Maximum visual effect is achieved in windy and dusky conditions. 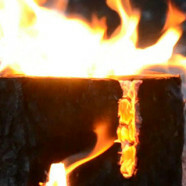 Also, the product creates an impressive effect once the fire has gone out but the candle is still glowing. 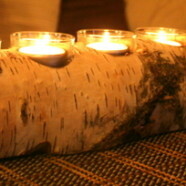 Outdoor candles are made of pine and spruce wood and burn off completely in ideal conditions. The eco-light produces a nice decorative effect with just one match. Creates a nice atmosphere with a real fire indoors, in a fireplace or outdoors. Easy to carry when camping, to use for grilling marshmallows or sausages over a fire or even frying eggs and meat in a pan. 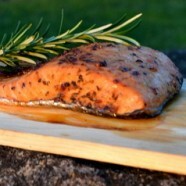 Made of pine. Includes a lighting disc. Burning time depends on diameter: 30 minutes to 2 hours. 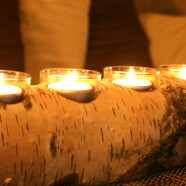 Natural-looking and decorative candle holders made of birch. Create a nice rustic atmosphere. Excellent gift idea. Different sets available. HANDMADE!